The painting shows an episode from the story of Krishna and Rukmini, known as the 'Rukmini-Harana' or 'Abduction of Rukmini'. 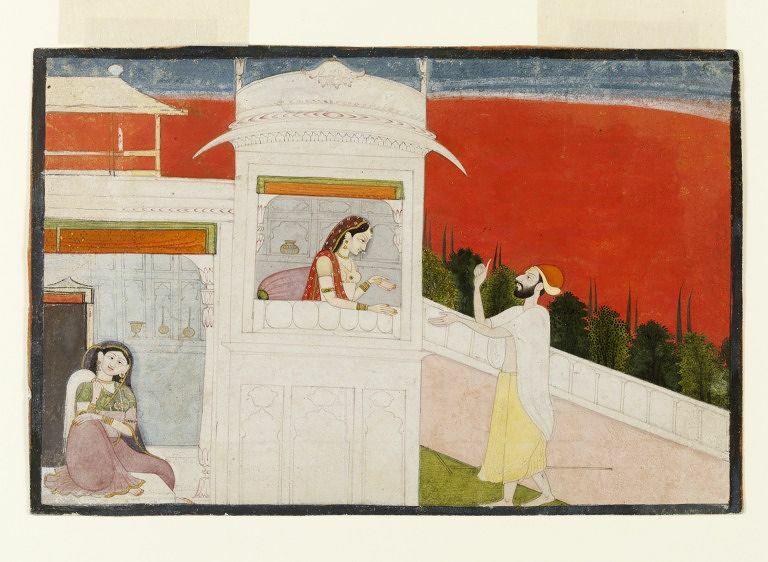 This scene shows Rukmini in a pavilion, listening to a messenger sent by her lover, the Hindu god Krishna. The messenger, shown with his hand raised to indicate that he is speaking, brings Rukmini the welcome news that Krishna intends to abduct her in order to prevent her marriage to another man. The bright red background accentuates the passionate feelings that Rukmini has for the absent Krishna. 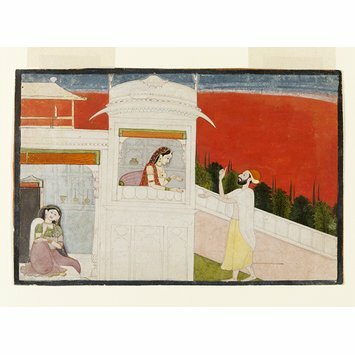 Painting, in opaque watercolour on paper, in which Rukmini is shown in a pavilion in the centre, leaning out towards a man with raised hand. A maid sits to the left of the painting. The scene is set against a bright red sky. Formerly in the Rothenstein collection.